Background: The central giant cell granuloma(CGCG) of bone constitutes about 10% of benign jawbone lesions. It affects females more often than males, mandible than maxilla. Biological behavior of CGCG ranges from a slow growing asymptomatic swelling to an aggressive process. True giant cell tumor (GCT) should be distinguished from CGCG. The histological distinction between these lesions depends on quite subtle differences. Expression of p63 has been demonstrated in GCT of bone conversely, has not been detected in CGCG. Therefore this short study attempts to study the expression of p63 in CGCG in conjunction with clinicopathological profile of the cases reported in the institute. Methods and materials: The retrospective study reviewed records for clinically and histopathologically diagnosed cases of CGCG from the archives of department of Oral pathology. Data was recorded and analyzed. These cases were subjected for IHC analysis for expression of p63, also RANK, RANKL in selected cases to study the nature of giant cells. Results and Conclusion: This paper is an institutional experience of clinicopathological profile of diagnosed cases of CGCG. Clinicopathological findings were in concurrent with previous literature. Total number of cases was ten. Six occurred in females and four in males. Most of them occurred in the second decade, more commonly involving mandible. Three cases showed recurrence. Histologically most showed classical features. Expression of p63 showed negativity in all the cases in accordance with the previous studies. RANK and RANKL showed strong and diffuse immunoexpression in both mononuclear and giant cells. Thus study supports the finding that p63 expression can be used to differentiate between CGCG and GCT. However, more number of studies with larger sample size are required to confirm reliability of using p63 as a distinguishing marker between GCT and CGCG. The central giant cell granuloma (CGCG) of bone constitutes about 10% of all benign lesions of the jawbones. It is more common in the mandible than in the maxilla and can be confined to the tooth-bearing areas of the jaws. CGCGs can also affect extragnathic bones, mainly in the craniofacial region, and small long bones such as those of hands and feet. It affects females more often than males, in a 2:1 ratio and is seen most frequently under the age of 30 years  and is more prevalent in the anterior than posterior jaws, often crossing the midline. Another entity of giant cell-rich osseous lesions is the giant cell tumors (GCTs) of the bone. 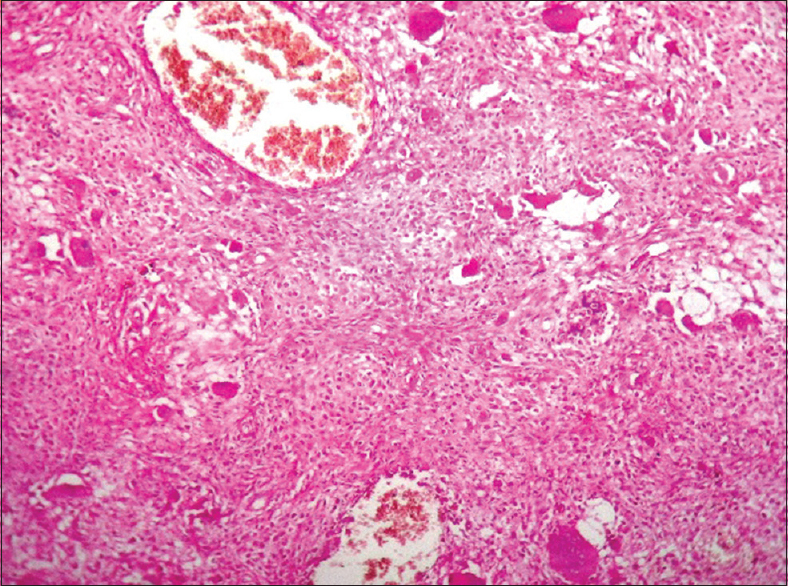 In contrast to the CGCG, the GCT is considered truly neoplastic. The true GCT of the jaws is rare and local prognosis is considered worse in GCT than in CGCG. The aggressive behavior of some of the CGCG is reminiscent of that of GCT of bones, and it was proposed that both belong to the same spectrum of lesions (Whitaker and Waldron, 1993). It is widely believed that GCT should be distinguished from other giant cell lesions, importantly CGCG which is considered to have a lower recurrence rate and for which no metastases have been reported. In the literature, there has always been a distinct delineation between the GCT of long bone and CGCG. Histomorphologic studies have shown that majority of jaw lesions can be distinguished from GCTs on histologic grounds although a smaller number of jaw lesions fall within the histologic profile of GCT of long bones. Pathologists have attempted, with varying results to identify histopathologic parameters to predict clinical behavior and prognosis of CGCG. Recent studies using immunohistochemistry (IHC) and molecular methods have demonstrated overexpression of p63 in the stromal cells of most GCTs of bone and advocate its use as a diagnostic marker. Expression of p63 has been demonstrated in GCT of bone conversely, has not been detected in CGCG., Therefore, this short study attempts to study the expression of p63 in CGCG in conjunction with clinicopathological features of CGCG cases reported in the institute. To study the IHC expression of p63 in CGCGs. This retrospective study reviewed the records from 1998 to 2015 and clinically and histopathologically diagnosed cases of CGCG were retrieved from the archives of the Department of Oral Pathology and Microbiology. Data were recorded and analyzed for clinical features with reference to age, gender, anatomical location, presentation, radiographic features, type of treatment and recurrence rate. Histopathological slides were studied and analyzed. Further, these cases were subjected for immunohistochemical analysis for expression of p63 and also selected cases for expression of RANK, RANKL to study the nature of giant cells and stromal components. 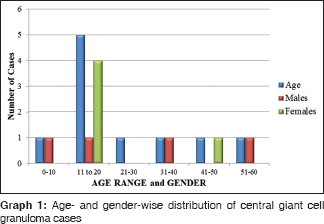 This retrospective study showed there were total 10 cases of CGCGs with an age range from 10 years to 60 years with most of them occurring in the second decade with an equal gender predilection [Graph 1]. Seven cases (70%) were found in the mandible and three cases (30%) in the maxilla and four cases (40%) showed crossing of the midline [Graph 2]. Most of the cases presented with expansile swelling and asymmetry of the face with only two presenting with pain. One case showed extensive bleeding and increased serum alkaline phosphatase. Radiographically, five cases (50%) showed multilocular radiolucency, three cases (30%) presented with well-defined unilocular radiolucency and two cases (20%) with diffuse radiolucency. One case showed cortical perforation whereas another presented with discontinuity of the lower border of the mandible. Out of three cases presenting in maxilla two cases showed the involvement of maxillary sinus. [Table 1] shows clinical and radiological findings of these cases. Seven cases were treated by surgical excision, i.e., curettage/with peripheral bone osteotomy. En bloc resection was done only in three cases (hemimandibulectomy-02 and mandibulectomy-01). Three cases (30%) showed recurrence. Histologically, most of them showed classical picture as reported in the literature with only few showing variations such as one case showing myxoid component and another showing fibrosis and osteoid formation was seen in three cases (30%). 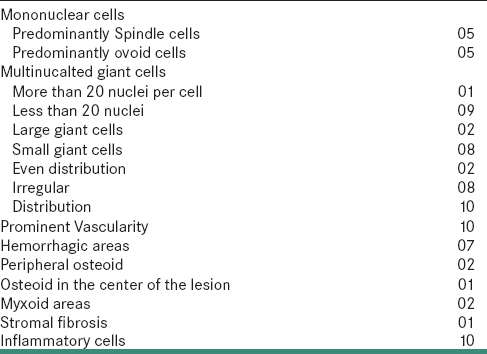 Aggressive features such as uniform distribution of giant cells were seen in two cases and another case showing more than 20 nuclei per cell. Details of the histopathological features are given in [Table 2]. IHC expression for p63 showed negative expression in all these cases [Figure 1]. In addition, expression of RANK and RANKL was studied in selected cases showed strong and diffuse immunoexpression in both mononuclear and giant cells [Figure 2] and [Figure 3]. CGCG most likely represents a non-neoplastic reactive process. Proposed etiologies include intraosseous hemorrhage, trauma, faulty bone development and abnormal repair of bone. Arguing in favor of the reactive process is the occasional association of CGCGs with other preexisting bone lesions such as fibrous dysplasia, Paget's disease of bone, central odontogenic fibroma, traumatic bone cyst and ossifying fibroma. However, possibility of some subtypes of CGCG of the jaws (those associated with syndrome) may have a systemic component, has not been conclusively ruled out. Much controversy surrounds the CGCG. It was not distinguished from the GCT of extragnathic skeleton, but later, it was described by Jaffe as the giant cell reparative granuloma. Some authors advocate using the more neutral term central giant cell lesion to describe this process and most accept the term CGCG. Whitaker and Waldron (1993) reported that CGCG of the jaws and GCT of long bones could represent the development of a single pathologic process that may be influenced by patient's age, location and other unknown factors. However, others have viewed them as distinct lesions. This paper is an institutional experience of clinicopathological profile of diagnosed cases of CGCG. Most of the clinicopathological findings were in concurrent with previous literature. The CGCGs may occur at any age but are more common in those under 30 years of age. Females are affected more frequently than males and are more often located in the mandible than in the maxilla., Similar to the previous studies in our study seven cases (70%) presented before the age of 30 years. In young children, the craniofacial skeleton is actively developing to include osteogenesis, exfoliation and eruption of teeth. These processes cease in adulthood and may, therefore, predispose to CGCG formation in younger individuals. 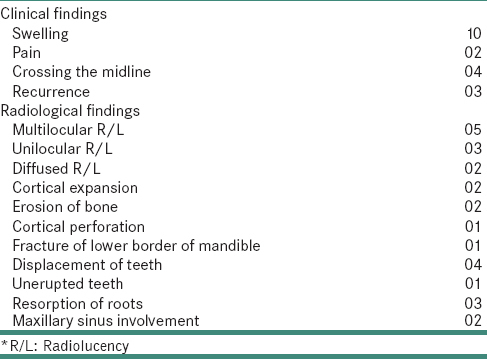 Mandible was more commonly involved (70%) as shown by others, wherein posterior mandible was involved in five cases (50%) followed by mandibular anterior one case (10%) (in contrast to the previous literature mandibular anterior predilection) with one case involving whole of the mandible. Whereas in the maxilla, all the three cases (30%) involved anterior region. Anterior lesions tend to show often crossing of the midline. 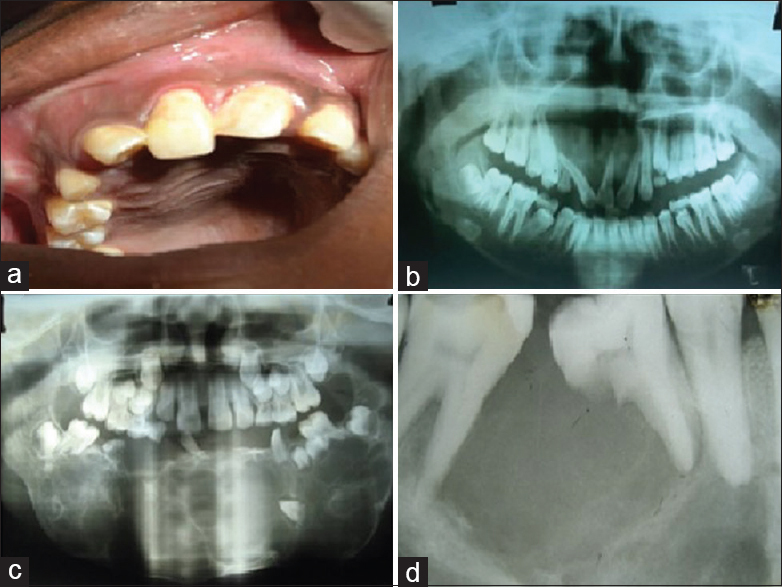 In the present study, four cases (40%) showed crossing of the midline with two being mandibular and two maxillary. In the literature reviewed, slight female predominance was found for CGCG, which may be explained by recent suggestions of the association between hormonal secretion and the appearance of CGCG in females. However, in the present study, no gender predilection was found. Clinical behavior of CGCGs may range from asymptomatic swelling to an aggressive process. Chuong et al. has classified them into aggressive and nonaggressive, depending on the presence of pain, rapid growth, root resorption, perforation of the cortex and a tendency to recur. Approximately 70% of CGCG have the biological behavior of a nonaggressive, asymptomatic, slow-growing whereas the remaining 30% show an aggressive, progressively destructive behavior. Similar to the previous studies swelling was the most common presentation (100%), in the present study [Figure 4]a. Associated pain was seen only in two cases (20%) as seen in Kruse-Losler et al. 2006 and Farrier et al. 2006. The radiographic features of CGCGs described in the literature are variable. The present study showed radiographic features that were all typical of the variously reported appearances of CGCG reported varying from multilocular radiolucency in five cases (50%) to unilocular in three cases (30%), whereas diffuse radiolucency was found in two cases (20%) [Figure 4]b,[Figure 4]c,[Figure 4]d. However, majority showed multilocular radiolucency. Due to this diversity of the radiographic presentation, it is well recognized that accurate diagnosis lies on the correct interpretation of clinical, radiographical and histopathological data for each patient, amalgamating this information enables correct diagnosis from other lesions such as hyperparathyroidism, ameloblastoma and GCT of long bones. Diagnosis based on clinical and radiographic features was correlating in seven cases (70%) only differing in three cases (30%) wherein the odontogenic tumor diagnosis was given. Based on the clinical and radiographic findings aggressive features (Kruse Losler et al. 2006, Choung et al. 1986) were shown by few cases such as cortical expansion was seen in three cases (30%), teeth displacement in four cases (40%). Root resorption was seen in three cases (30%). Perforation of the cortex was seen only in one case, and another showed discontinuity in the lower border of the mandible. Recurrence rate of CGCG is reported to range from 13% to 49%. In the present study, three cases (30%) showed the recurrence in which two cases showed multiple recurrences. The histological features of CGCG are defined by the WHO as an intraosseous lesion consisting of fibrous tissue containing multiple foci of hemorrhage, aggregations of multinucleated giant cells and occasionally trabeculae of bone. Various studies have been attempted to ascertain which, if any histologic features could be used to separate those lesions that were aggressive from those exhibited indolent behavior. Losler et al. proved that there is a significant increase in large giant cells, fractional surface area and mitotic activity in aggressive lesions. Kaban et al. showed a higher relative size index of giant cells in aggressive lesions. Ficarra et al. found higher number of giant cells and greater fractional surface area in clinically aggressive lesions. Whereas Auclair et al. using similar cytometric methods were unable to find any significant histological differences between recurrent and nonrecurrent lesions. Liu et al. found it difficult to predict the clinical behavior by its histopathologic patterns only. Histologically, most of our cases showed classical features consisting of mononuclear cell population of mixture of spindle to ovoid cells similar to the previous studies [Figure 5]. Few cases showed variations like myxoid areas in one case (10%) and fibrosis in another case (10%). Histological features that are considered to be suggestive of aggressive behavior were seen in only three cases (30%) with two cases showing uniform distribution of the giant cells and another case showing more than 20 nuclei per giant cell. The presence of osteoid especially at the periphery is considered to be a feature of nonaggressive behavior. It is stated that these may formed as a reactive osteogenic walling off phenomenon or these lesions may have been thoroughly curetted  or may represent a feature of regression to presurgical intralesional medications such as steroids. In the present study, the presence of peripheral osteoid was seen was seen in two cases (20%) and one case showed osteoid in the center of the lesion. The conventional therapy for CGCG of the jaw bones is local curettage, but a recurrence rate of up to 70% has been reported, mainly for lesions that display an aggressive behavior (Chuong et al., 1986; Kaban et al., 2007; Vered et al., 2007). For them, extensive surgical procedures are needed that often result in serious mutilation of the jaws and face as well as loss of teeth and dental germs in young patients. It is for this reason that new therapeutic modalities and operative strategies have become a necessity. Alternative methods of treatment include nonsurgical methods such as intralesional injection of steroids, subcutaneous injection of calcitonin or interferon-α with an aim to accomplish resolution or reduce the size of the lesion as surgical method may mutilate the jaws especially., Calcitonin acts as antagonistic to effects of parathyroid hormone, by inhibiting osteoclastic bone resorption. Intralesional injection of steroids it is hypothesized that bone resorption is inhibited by giant cells. Interferon-α appears to be useful in the management of aggressive CGCG presumably due to its antiangiogenic effect. In the surgical method of treatment of CGCG, the extent of surgery is related to the size, and position of the lesion ranging from simple excision and curettage to en bloc resection and reconstruction. In the present study, majority of the cases (70%) treated were by surgical excision and curettage with peripheral bone, whereas en bloc resection was done in only three (30%) cases. Only one case was treated with intralesional steroids to reduce the size of the lesion followed by surgical excision. Immunohistochemical expression of RANK/RANKL has been shown in CGCG of the jaws. It is hypothesized that the giant cells arise from peripheral blood mononuclear cells, which are recruited by the spindle-shaped stromal cells. Osteoclast formation involves the interaction between stromal cells, which express RANKL, and mononuclear osteoclast precursors expressing RANK. The giant cells in CGCG are derived from a subset of mononuclear phagocytes. Because the giant cells in CGCGs are osteoclasts, this indicates that osteolytic expansion in CGCG can be controlled by therapeutic agents that inhibit RANKL/RANK interactions, such as osteoprotegerin and AMG/162. In the current study, selected cases were also subjected for IHC expression of RANK and RANKL to study the nature of giant cells. They showed strong and diffuse positivity for RANK and RANKL both in the mononuclear cells and giant cells supporting the nature of these giant cells being osteoclasts [Figure 2] and [Figure 3]. 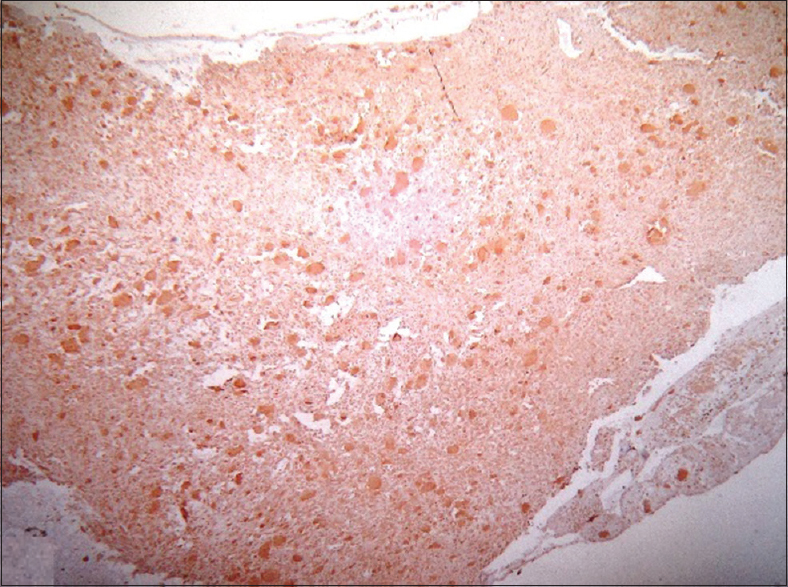 Few cases of CGCGs have shown overlapping features with GCT; there have been only few histological criteria to distinguish. Borderline cases show features of both. Expression of p63 has been found by some to be useful to distinguish between GCT and other giant cell lesions. p63 is a member of the p53 gene family that is expressed in the epithelial basal cells of different organs, including skin, uterine cervix, breast, urinary bladder and prostate. Alterations in p63 have been detected in variety of tumors and have been implicated in tumor pathogenesis. p63 is widely used in general surgical pathology, mostly as a diagnostic aid in breast and prostate cancer. The mononuclear stromal cells display strong p63 immunostaining in GCTs but this has not been detected in CGCGs. 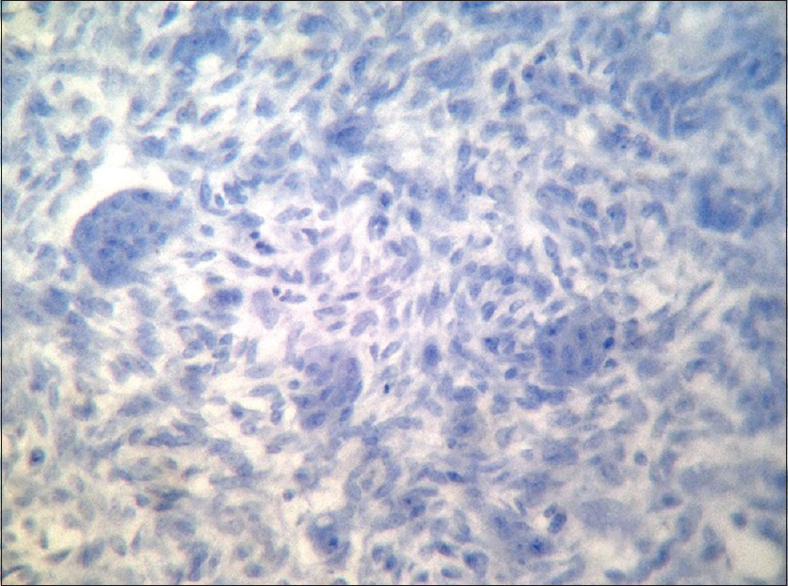 Thus, p63 marker is one immunohistochemical stain that may help to distinguish GCT from CGCG. A study was carried out to determine whether GCT of bone express p63, and to examine whether p63 can be used as a biomarker to discriminate GCT of bone from other giant cell lesions. Immunostaining for p63 demonstrated expression in all cases of GCT of bone examined and a substantial number of cases of aneurysmal bone cyst and chondroblastoma; conversely, it was not detected in CGCG, GCT of tendon sheath or pigmented villonodular synovitis. It was suggested that the lack of p63 expression in CGCG indicates those are different from GCT of bone and raises the possibility that p63 may be involved in the pathogenesis of GCT of bone but determination of its exact role requires further investigation. It was concluded that p63 expression appears to differentiate GCT of bone from CGCG and other giant cell-rich lesions; however, further investigation using a larger sample size is necessary to confirm the clinical utility of these observations. In the present study, all cases showed negative expression for p63 in accordance with the previous studies [Figure 1]. Thus, our study supports the finding that p63 is not expressed in CGCG and can be used as marker to differentiate between CGCG and GCT. However, more number of studies with larger sample size including CGCG and GCTs may be required to confirm the finding. This is an institutional experience of the clinicopathological profile of 10 cases of CGCGs. Most of the findings were in concurrent with previous literature. As observed in the present study in overlapping cases, p63 may help in differentiating CGCG from GCT. However, more number of studies with larger sample size including CGCG and GCT of bone are required to confirm this finding and using of p63 as a distinguishing marker between CGCG and GCT of bone. The present study also affirms the nonneoplastic nature of CGCG. Dr. Sanjay Navani MD, Surgical Pathologist and Immunohistochemist, LABSURGPATH, Mumbai. Vered M, Buchner A, Dayan D. Central giant cell granuloma of the jawbones – New insights into molecular biology with clinical implications on treatment approaches. Histol Histopathol 2008;23:1151-60. Kruse-Losler B, Diallo R, Gaertner C, Mischke KL, Joos U, Kleinheinz J. Central giant cell granuloma of the jaws: A clinical, radiologic, and histopathologic study of 26 cases. Oral Surg Oral Med Oral Pathol Oral Radiol Endod 2006;101:346-54. Bilodeau E, Chowdhury K, Collins B. A case of recurrent multifocal central giant cell granulomas. Head Neck Pathol 2009;3:174-8. Aragao Mdo S, Piva MR, Nonaka CF, Freitas Rde A, de Souza LB, Pinto LP. Central giant cell granuloma of the jaws and giant cell tumor of long bones: An immunohistochemical comparative study. J Appl Oral Sci 2007;15:310-6. Whitaker SB, Waldron CA. Central giant cell lesions of the jaws. A clinical, radiologic and hitopathologic study. Oral Surg Oral Med Oral Pathol 1993;75:199-208. Saw S, Thomas N, Gleeson MJ, Bodi I, Connor S, Hortobagyi T. Giant cell tumor and cental giant cell reparative granuloma of the skull: do these represent ends of a spectrum? A case report and literature review. Pathol Oncol Res 2009; 15; 291-95.
de Lange J, van den Akker Hp, van den Berg H. Central giant cell granuloma of the jaws: a review with emphasis on therapy options. Oral Med Oral Pathol Oral Radiol Endod 2007; 104:603-15. Mahajan A, Ganvir SM, Hazarey VK. Correlation of clinic-pathologic features and AgNOR counts between aggressive and nonaggressive central giant cell lesion. J Oral Maxillofac Pathol 2015;12:8-15. Dickson BC, Li SQ, Wunder JS, Furguson PC, Eslami B, Werier JA, et al. Giant cell tumor of bone express p63. Mod Pathol 2008;21:369-75. Edwards PC, Fantasia JE, Saini T, Rosenberg TJ, Sachs SA, Ruggiero S. Clinically aggressive central giant cell granulomas in two patients with neurofibromatosis 1. Oral Surg oral Pathol Oral Radiol Endod 2006; 102: 65-72. 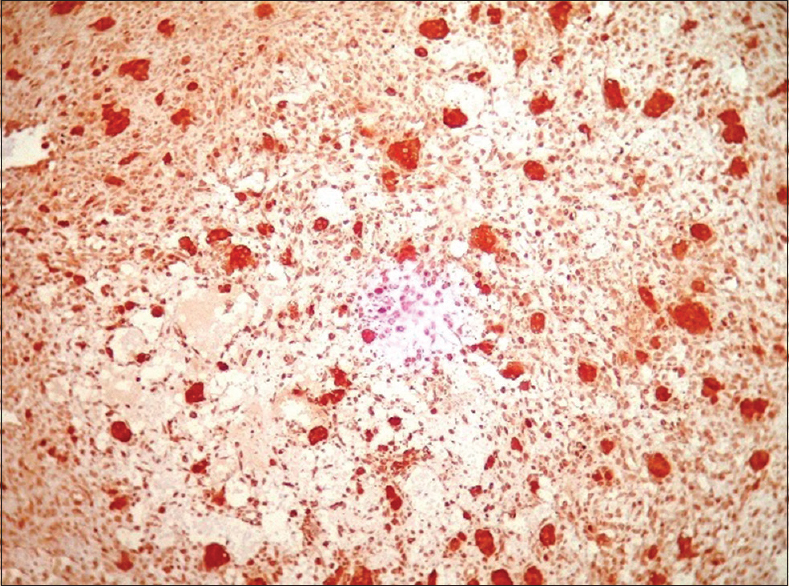 Kaur N, Kohli T, Chhina K. Central giant cell granuloma : A diagnostic predicament. J of Adv Med and Dent Sci Res 2016; 4:90-95. Farrier SL, Farrier JN, Smart MK, Nash ES. 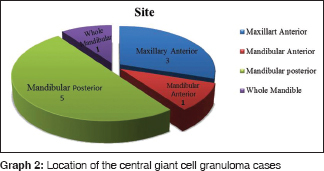 A 10-year review of the occurrence and treatment of central giant cell granulomas, in a District General Hospital. J Oral Pathol 2006; 35:332-37. Bodner L, Bar-Ziv J. Radiographic features of central giant cell granuloma of the jaws in children. Pediatr Radiol 1996; 26:148-51. Stavropoulos F and Katz J. Central giant cell granulomas: A systematic review of the radiographic characteristics with the addition of 20 new cases. Dentomaxillofac Radiol 2002;31:213 -17. Choung R, Kaban LB, Kozakewich H, Perez- Atayde A. Central giant cell lesions of the jaws: a clinicopathologic study.J Oral Maxillofac Surg 1986;44:708-13. Daroit NB, de Marco RG, Anna Filho MS, Fritscher GG. The challenge in the treatment of central giant cell granuloma – What is the best approach? J Oral Maxillofac Surg Med Pathol 2017;29:122-8. Curtis NJ, Walker DM. A case of aggressive multiple metachronous central giant cell granulomas of the jaws: Differential diagnosis and management options. Int J Oral Maxillofac Surg 2005;34:806-8.
de la Roza G. P63 expression in giant cell-containing lesions of bone and soft tissue. Arch Pathol Lab Med 2011;135:776-9.